Galveston is going green with the installation of three convenient electric car (e-car) recharging locations throughout the island. Mitchell Historic Properties has installed level-2, DC Fast Charge (DCFC) port e-car charging stations by Blink in the Harbor Square parking lot adjacent to popular downtown eateries Starbucks and Jimmy John’s, as well as at the only historic hotel on the Texas Gulf Coast, Hotel Galvez & Spa, and at downtown hotel, The Tremont House. The public charging stations are user friendly and quick to use. 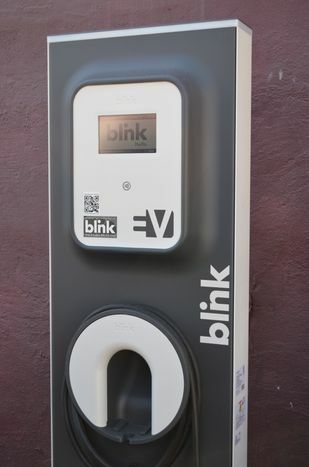 The Blink system uses smart level-2 DCFC chargers that email or text the registered vehicle’s account when the car becomes unplugged or reaches a full charge. The stations also automatically stop charging the vehicle when the battery reaches maximum charge, preventing excess cost to the user. Additionally, the Blink system utilizes the power of mobile technology to let e-car drivers know, either via a smart phone app or the car’s built in navigation system, where to find the nearest charging station. Mitchell Historic Properties installed the first two level-2 public e-car charging stations on Galveston Island in the Harbor Square parking lot adjacent to downtown’s Starbucks and Jimmy John’s Restaurants at the intersection of 22nd Street and Harborside Drive. The chargers are easy to use and work with electrically powered cars such as the Nissan Leaf and the Chevrolet Volt. 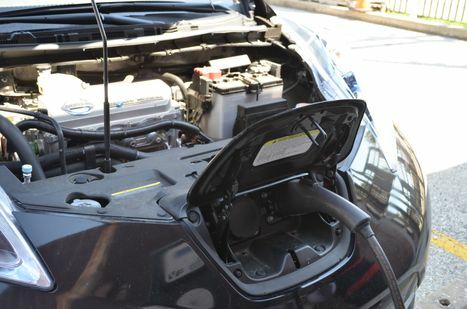 Tesla owners can also utilize the charging stations using an adaptor included with the purchase of their vehicle. Two public charging stations are also active at Mitchell Historic Properties’ popular seawall hotel, Hotel Galvez & Spa. Day-trippers and hotel guests alike can make use of the Blink charging stations located in the Hotel Galvez parking garage on 21st Street and Seawall Blvd. First time Blink users can pick up a complimentary access card from the concierge at Hotel Galvez & Spa, which will allow the user to create an account with Blink. Users may also pay directly with their personal credit card. Visitors staying at The Tremont House can also make use of the complimentary charging stations. Unlike the stations located at Harbor Square and Hotel Galvez, the Blink stations at The Tremont House are not available for public use. However, visitors who choose to valet at The Tremont House while staying overnight or while on business at the hotel can take advantage of complimentary recharging. Mitchell Historic Properties (MHP) oversees Galveston properties owned by developer, philanthropist and preservationist George Mitchell and the Mitchell family. MHP owns and preserves approximately one-fourth of the buildings in The Historic Strand Seaport Area including commercial and residential properties as well as Hotel Galvez & Spa, The Tremont House and Harbor House, the hotel and marina at Pier 21. The Mitchell’s ongoing preservation of Galveston’s historic downtown helped spark the resurrection of The Strand National Historic Landmark District and Pier 21 as a tourist destination. For leasing information, visit www.MitchellHistoricProperties.com or call (409) 763-5806. A Chevrolet Volt being charged at The Tremont House. One of the electric car charging stations now available at The Tremont House, Hotel Galvez & Spa and Harbor Square in downtown Galveston.